Hi friends! It’s Nicole again from Birkley Lane Interiors, where I help women solve their decorating problems. When I’ve visited in the past I’ve shared things like the Fixer Upper Throw Pillow shopping guide and the DIY Pom Pom Wreath. I’m so happy to be with you again! Today I’m sharing some bathroom organization ideas to help get your bathroom functioning smoothly! Bathrooms can be a tough place to organize: generally, there is limited space (unless you’re Oprah, whom I’m assuming has an amazing bathroom!) (Speaking of amazing bathrooms, you’ve got to check out this Modern Farmhouse Bathroom Reveal!) 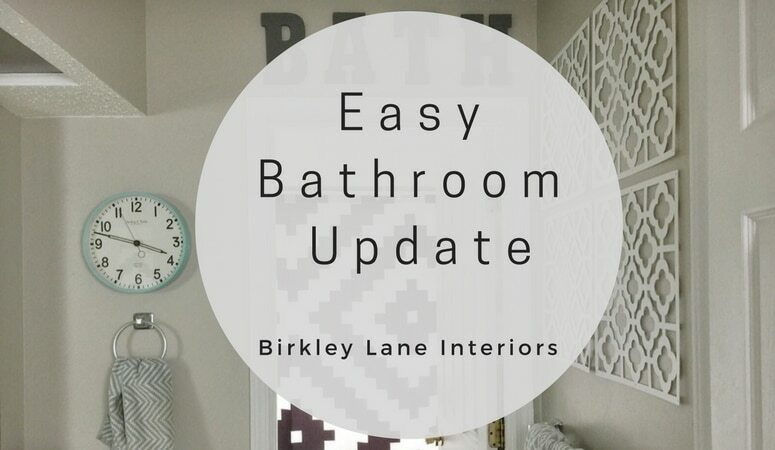 So, I’ve gathered some bathroom storage ideas for small spaces, cheap bathroom storage ideas and even solutions if you have no counter space in your bathroom! As you go through this roundup, please pin each image from the original source! I love this bathroom storage idea for small spaces from Polished Habitat! When space is limited, you need to get creative and using vertical space is such a smart way to do that! It’s always nice to have extra toilet paper and towels handy for easy access. 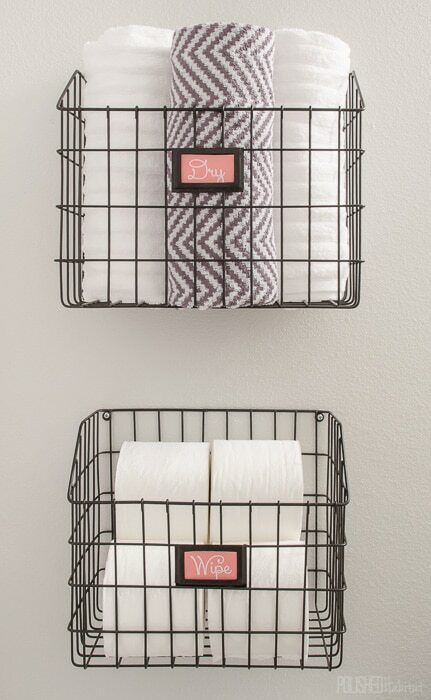 And using these wire baskets adds style plus functionality! Check out her full bathroom here! Great idea from the Crazy Craft Lady! The dollar store is a great place to find cheap bathroom storage ideas! You don’t always know what the dollar store will have, but you can get creative with what you find! Using labels take this bathroom organization to the next level! Check out her full bathroom here. Farm Fresh Homestead has the most adorable farmhouse bathroom! I absolutely love this towel rack! 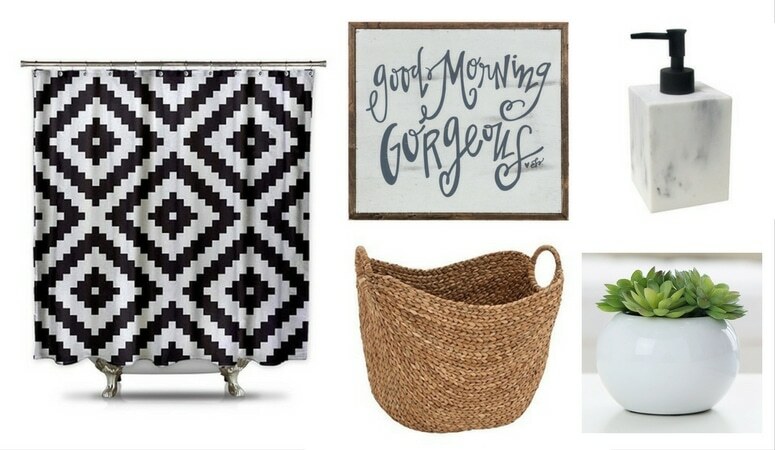 She has great ideas for adding farmhouse style into your bathroom organization! Check out her full bathroom here. Refresh Living shares a great (and easy) DIY for how to organize bathroom counters! 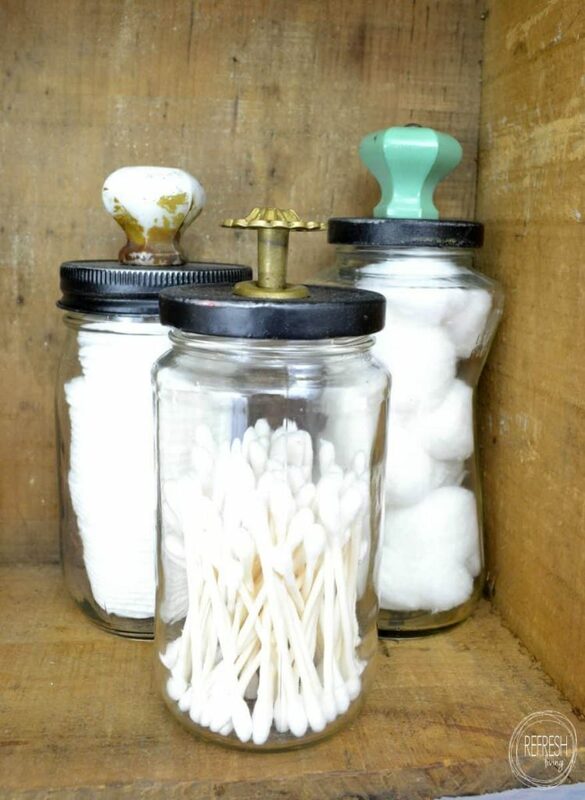 These glass jars are a cute accent and also functional storage! Check out the full bathroom here. 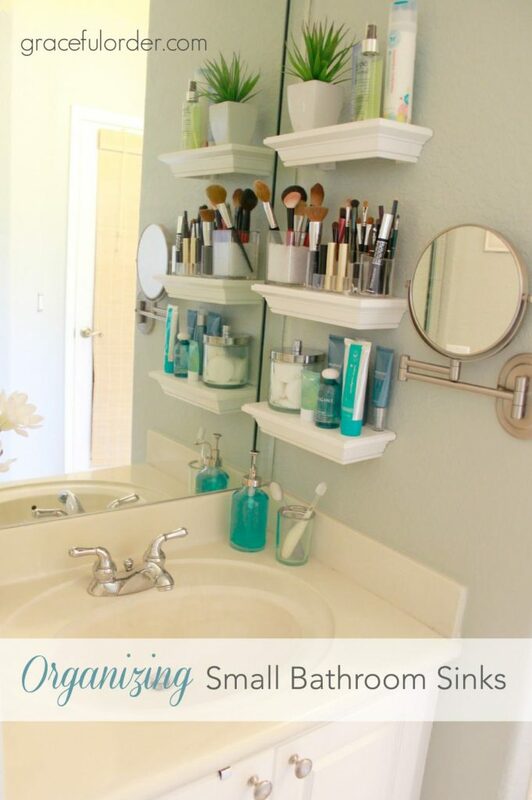 I love this bathroom organization hack from Chatfield Court! 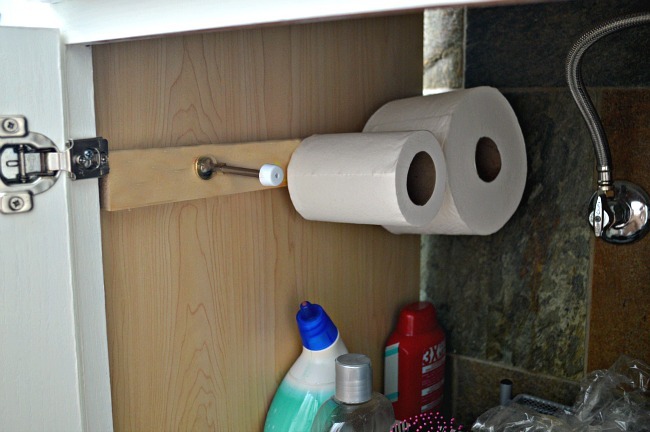 I never would have thought to use door stoppers to hold toilet paper! This is a great use of space inside your bathroom cabinets! It keeps the toilet paper off the floor so you can use that space for other things! Check out the full bathroom here. It All Started With Paint shares their bathroom shelving. Again, another great use of empty, vertical space! I absolutely love the baskets she used to add texture, color and storage. You can check out her full bathroom here. 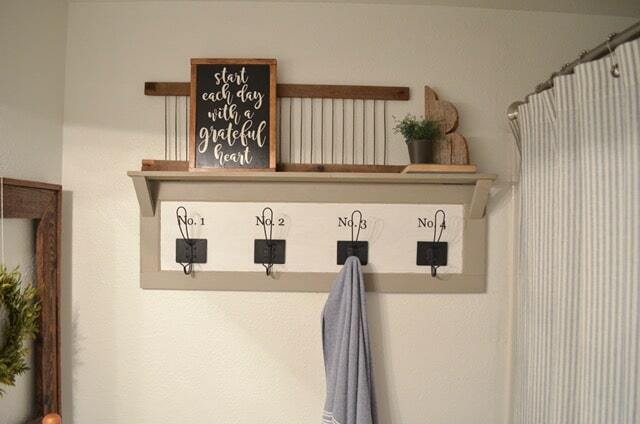 I love these bathroom organization ideas from Paint Yourself a Smile. She shares a great solution for those with no counter space in the bathroom: use a rolling cart! 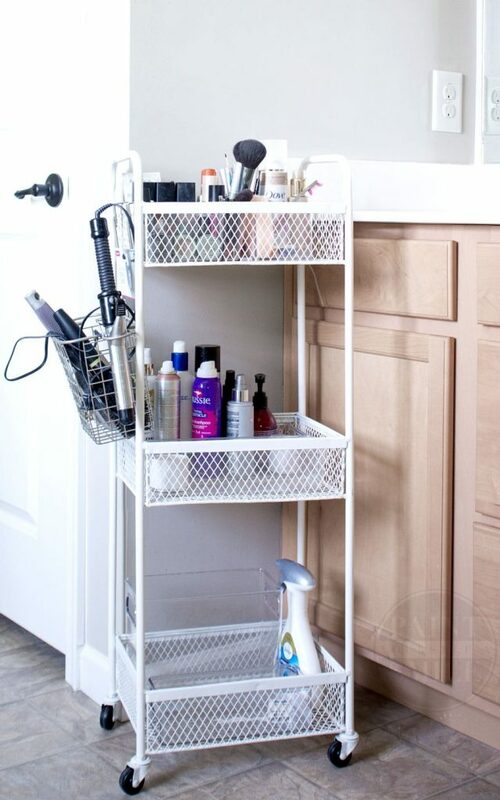 The cart adds tons of extra shelves and places to hang your blow dryer and curling irons. See her full bathroom here! This is a brilliant idea from Cherished Bliss. Make your medicine cabinet magnetic and it instantly becomes more functional! See her full tutorial here! Love this idea from The DIY Mommy. 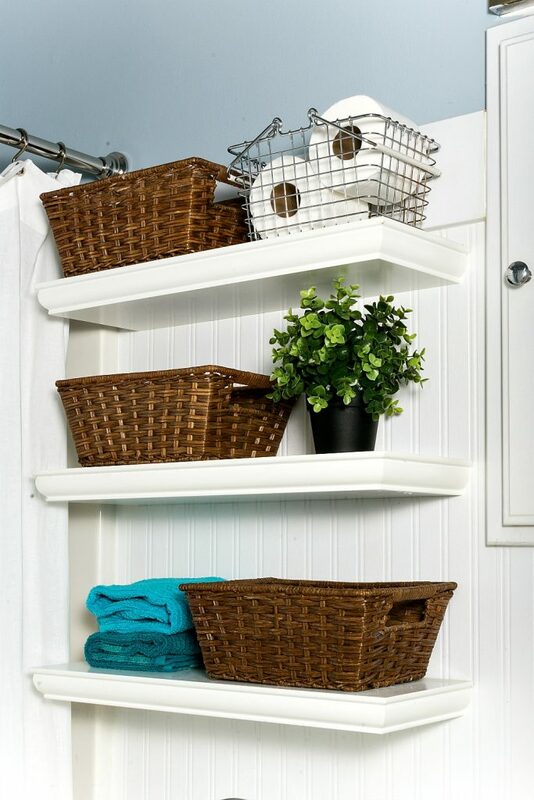 Again, great use of space, because in these bathroom organization ideas, the baskets are off the counter! But, still in easy reach for those kiddos! Check out her full tutorial here! Blesser House shares her gorgeous modern farmhouse bathroom makeover! 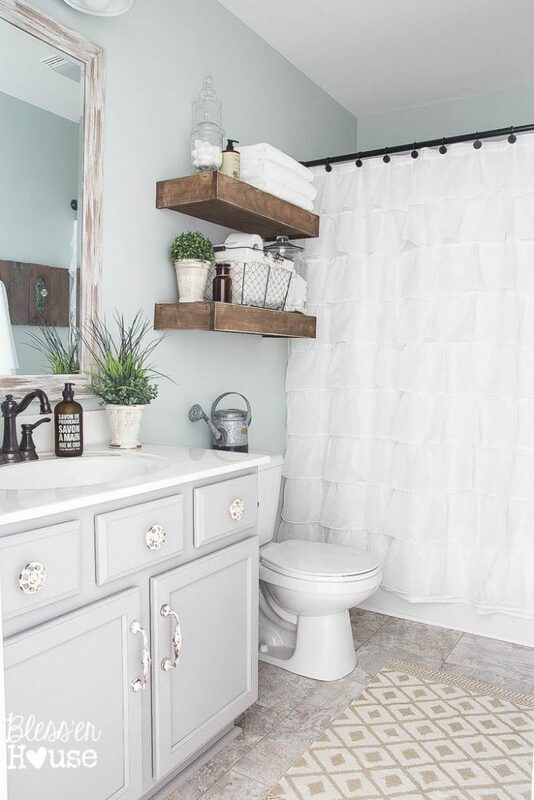 I love those chunky shelves that she uses for storage over her toilet—another great idea for a place that goes unused! See her full, beautiful bathroom here! 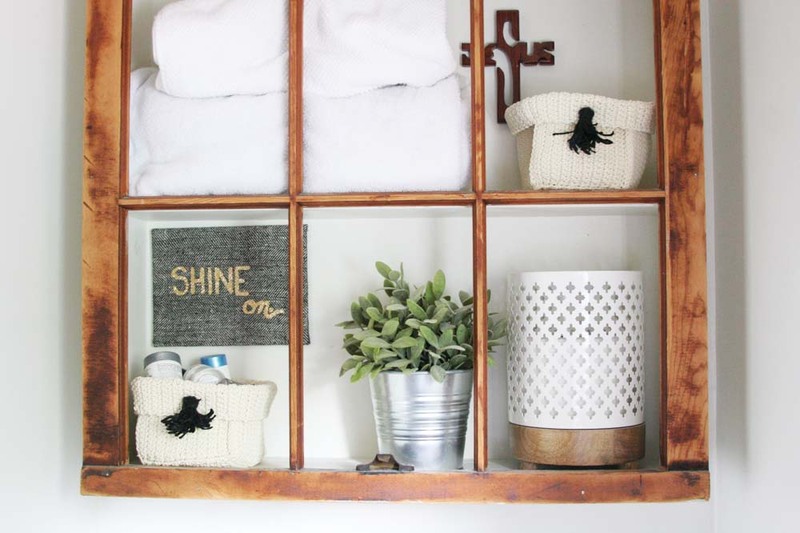 The Liz Marie Blog shares her cute bathroom vanity with us! 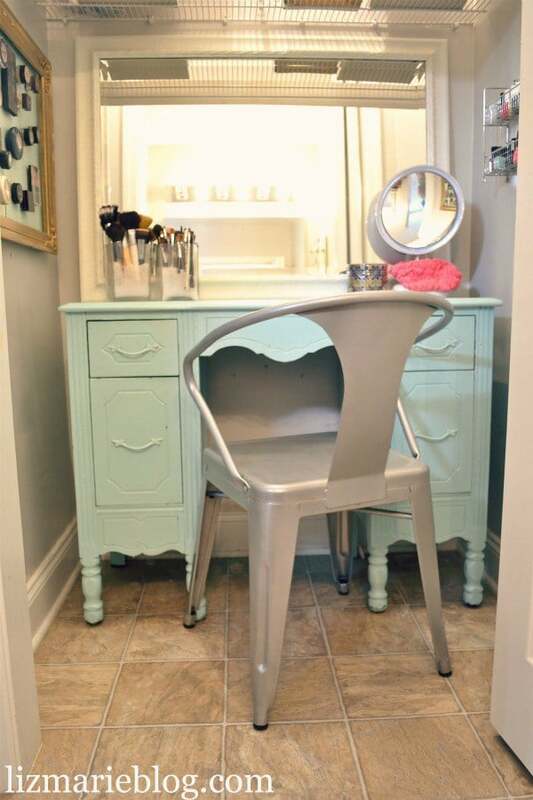 She turns a little closet they weren’t using into her vanity area and has some great storage ideas for your makeup! Love the pops of color and that gorgeous farmhouse chair. See it here! Graceful Order gives us a peak into her teeny vanity! With very limited bathroom counter space and storage, she gets creative with shelving and even adds a great mirror! See her full bathroom here! Love this cute idea from Creativity Designs! If you’re looking for a way to add farmhouse style to your bathroom organization ideas, this is a great way to do it! See her full bathroom here! 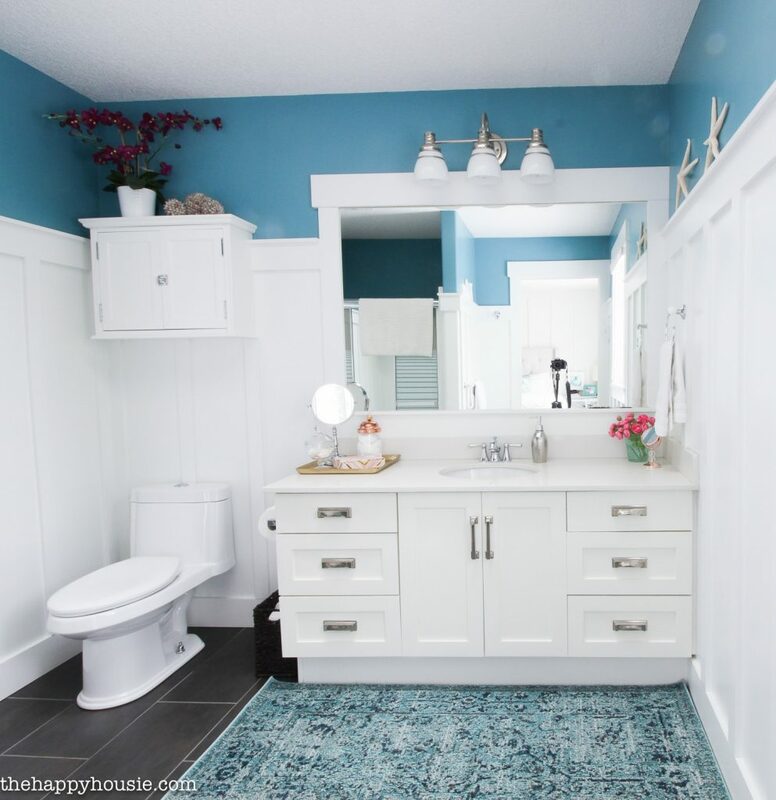 The Happy Housie Porch shares her darling, turquoise bathroom and all her tips on how to get your bathroom completely organized! See it here. 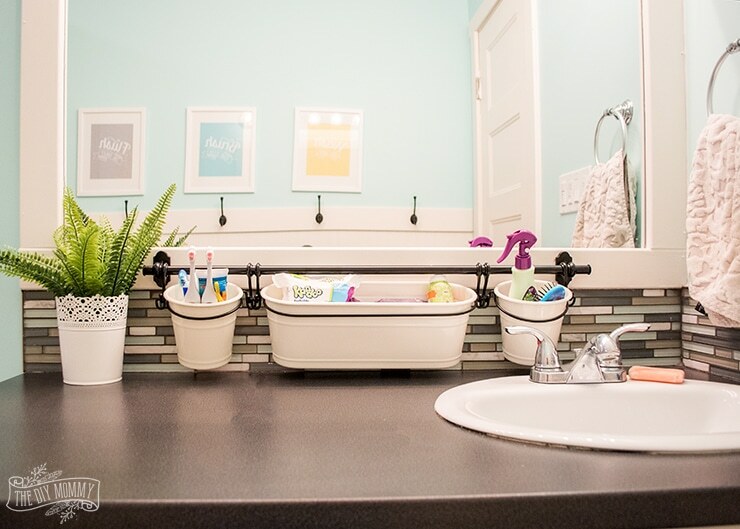 The Pinning Mama shares five easy bathroom organization ideas! 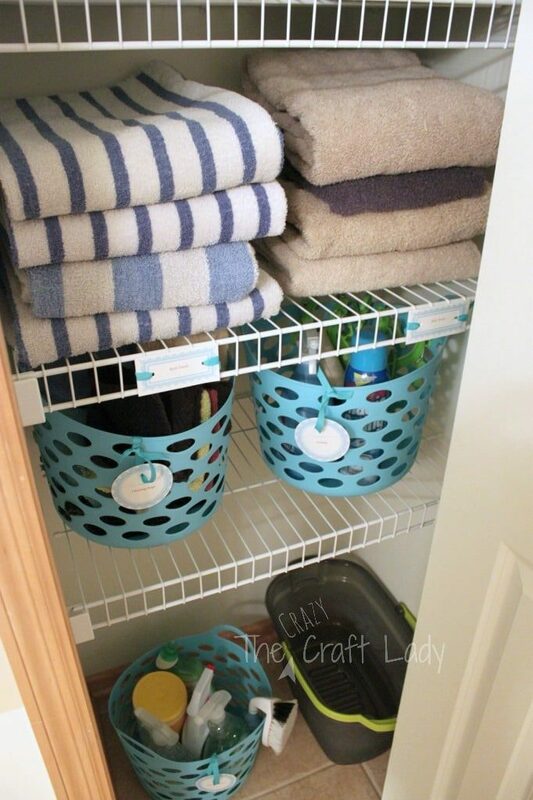 I love her ideas to organize the bathroom cabinet under the sink buy using file holders! I never would have thought of that! Check out her full bathroom here. What did you think of these bathroom organization ideas? I hope you are inspired and motivated to get your bathroom organized and functional—and even add in some stylish accents along the way! And if you’re up to a bit of dirty work, check out How To Update an Old Bathroom Vanity! 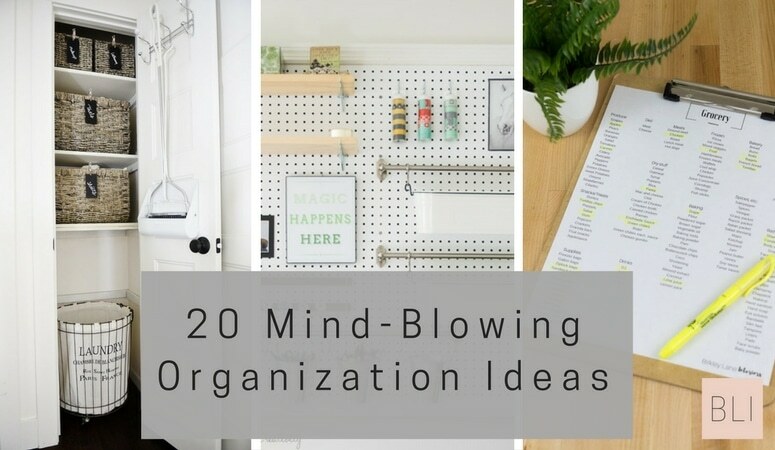 If you liked this post, you’ll love my posts on 20 Mind-Blowing Organization Ideas, Bathroom Decor Essentials and Our Easy Bathroom Update!